My good friend and fellow artist Kent Peaslee came down from Chicago to spend a week with me playing with Li-Qua-Che. It was like creating our own artists residency. What is Li-Qua-Che? Basically it's a liquid paper mache that has been refined to the point that it looks more like porcelain slip. It's designed to make slip castings of things like doll heads. During our week of investigation, we played with a lot of casting techniques, learning a lot and pushing the product to its limits. 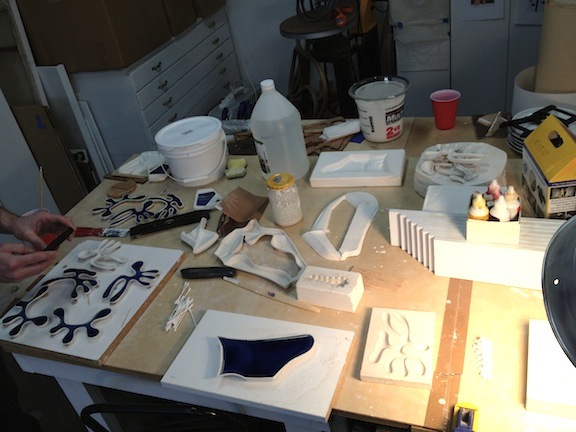 Over the next four BFS blog posts I'll be reviewing projects that focus on casting a tile from a one piece mold. Our first project was to create an 8"x11" sculptural tile that incorporates an open space in the center of the tile. 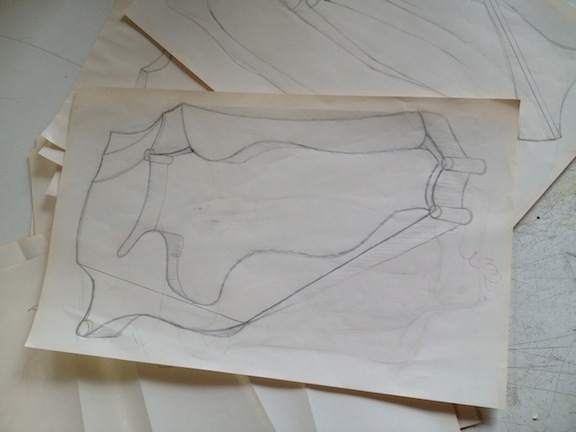 Above is the original design drawing. In this photo we are building the sub-straight for the tile using sheets of cork. 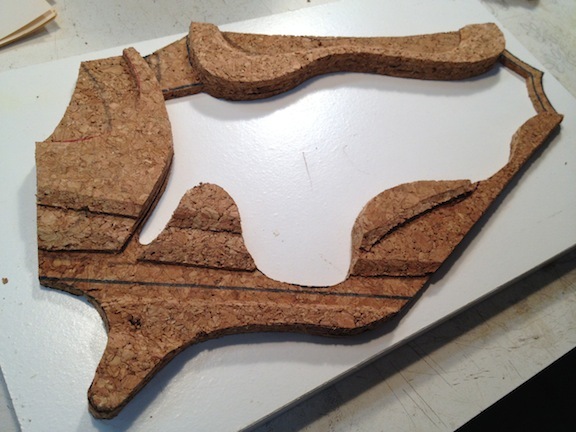 We then covered the cork with oil clay and added some details. 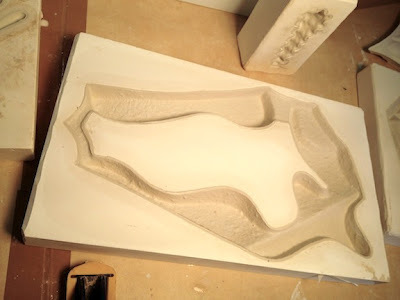 This is the plaster mold we pulled from the model. The mold was placed in a warm oven to speed the evaporation of the water from the plaster. Be careful doing this as the plaster will go through thermal shock if it gets too hot too quickly or cools down too fast. Now for some casting. 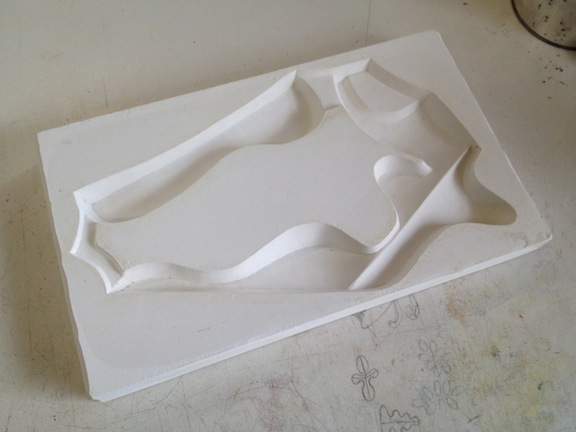 Here the Li-Qua-Che has been poured into the mold. After waiting 8 minutes it was poured out of the mold. What remains is a 1/8" thick wall of Li-Qua-Che (The gray stuff). The Li-Qua-Che shrinks 4-7% as it dries. Just like slip casting with ceramic slip, it pulls away from the walls releasing itself. In theory, as long as there are not undercuts, the casting, after 30-60 minutes should just drop out of the mold. Unfortunately our design with the big open space in the middle of the tile created a large solid form that the Li-Qua-Che locked onto as it shrank. Getting it out of the mold caused cracks in the casting. 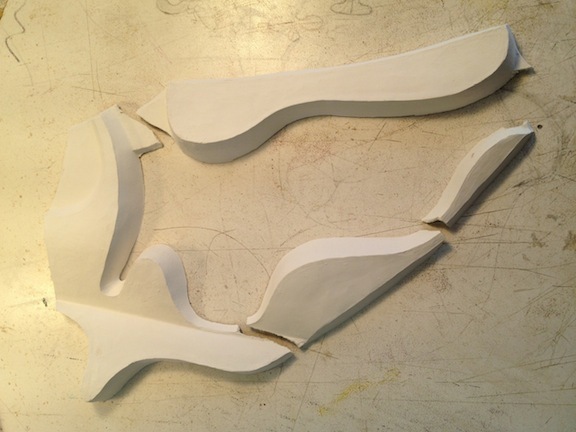 After curing, the casting simply fell apart at the weakest structural points.